Impingement syndrome is one of the most common causes of shoulder pain. It occurs when there is damage to the soft tissue in the shoulder, rather than the bone. A group of muscles and tendons wrap around the ball part of the ball and socket joint. These muscles coordinate the motion of the ball so it rolls instead of slides when you move your shoulder. When you become older, or when you tear a shoulder muscle, the ball starts to slide rather than roll. 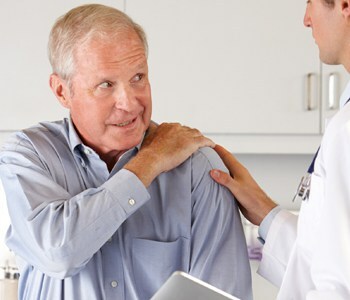 As a result, it “impinges” upon the rest of the shoulder, causing pain. In most cases, anti-inflammatory medications such as ibuprofen will effectively treat the problem. Steroid injections also reduce the pain. If you wait to seek treatment, you may start adjusting your motions to compensate for the pain. That could lead to the need for more formal interventions, such as physical therapy or even surgery in rare cases.